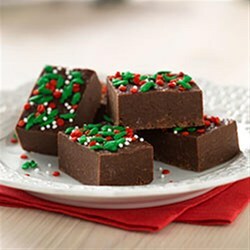 Smooth, creamy chocolate fudge squares topped with colorful sprinkles will add a sparkle to your holiday treat platters. Line 8-inch square pan with foil, with ends of foil extending over sides. Microwave first 4 ingredients in large microwaveable bowl on HIGH 2 min. or until butter is melted; stir until chocolate is completely melted. Add dry pudding mix; stir with whisk 2 min. Add powdered sugar, 1 cup at a time, stirring after each addition until blended; press onto bottom of prepared pan. Top with sprinkles; press into fudge to secure. Refrigerate 2 hours or until firm. Use foil handles to lift fudge from pan before cutting into pieces.